The CMS Collaboration at CERN has released more than 300 terabytes (TB) of high-quality open data. These include over 100 TB, or 2.5inverse femtobarns (fb−1), of data from proton collisions at 7 TeV, making up half the data collected at the LHC by the CMS detector in 2011. This follows a previous release from November 2014, which made available around 27 TB of research data collected in 2010. Available on the CERN Open Data Portal — which is built in collaboration with members of CERN’s IT Department and Scientific Information Service— the collision data are released into the public domain under the CC0 waiver and come in types: The so-called “primary datasets” are in the same format used by the CMS Collaboration toperform research. The “derived datasets” on the other hand require a lot less computing power and can be readily analysed by university or high-school students, and CMS has provided a limited number of datasets in this format. Further, a CMS physicist in Germany tasked two undergraduates with validating the CMS Open Data by re-producing key plots from some highly cited CMS papers that used data collected in 2010. Using openly available documentation about CMS’s analysis software and with some guidance from the physicist, the students were able to re-create plots that look nearly identical to those from CMS, showing what can be achieved with these data. “I was pleasantly surprised by how easy it was for the students to get started working with the CMS Open Data and how well the exercise worked,” says Achim Geiser, the physicist behind this project. Simplified example code from one of these analyses is available on the CERN Open Data Portal and more is on its way. Prior to the launch of the CERN Open Data Portal with the first batch of research-quality data from CMS, the Collaboration had provided certain curated datasets for use in high-school workshops. These “masterclasses”, developed by QuarkNet and conducted under the aegis of the International Particle Physics Outreach Group, bring particle-physics data to thousands of high-school students each year. These educational datasets are also available on the CERN Open Data Portal, along with an “event display” for visualising the particle-collision events. Two years ago, the Higgs Boson was discovered by the ATLAS and CMS experiments. But how precisely does it fill its role as the last missing piece in the Standard Model of particle physics? The Large Hadron Collider will restart in 2015 with almost double the collision energy to test just that. But even then, this theory only accounts for 5% of the Universe, and does not include gravity.Can the LHC shed light on the origin of dark matter? Why is gravity so much weaker than the other forces? Dr Pippa Wells explains how the LHC will explore these mysteries of matter. Pippa Wells was the Inner Detector System Project Leader on the ATLAS Experiment at CERN. ATLAS is one of two general-purpose detectors at the Large Hadron Collider (LHC). It investigates a wide range of physics, from the search for the Higgs boson to extra dimensions and particles that could make up dark matter. The discovery of a new boson with a mass of approximately 125 GeV in 2012 at the Large Hadron Collider has heralded a new era in understanding the nature of electroweak symmetry breaking and possibly completing the standard model of particle physics. Since the first observation in decays to γγ, WW and ZZ boson pairs, an extensive set of measurements of the mass and couplings to W and Z bosons, as well as multiple tests of the spin-parity quantum numbers, have revealed that the properties of the new boson are consistent with those of the long-sought agent responsible for electroweak symmetry breaking. An important open question is whether the new particle also couples to fermions, and in particular to down-type fermions, as the current measurements mainly constrain the couplings to the up-type top quark. Determination of the couplings to down-type fermions requires direct measurement of the corresponding Higgs boson decays, as recently reported by the Compact Muon Solenoid (CMS) experiment in the study of Higgs decays to bottom quarks15 and τ leptons. Here, we report the combination of these two channels, which results in strong evidence for the direct coupling of the 125 GeV Higgs boson to down-type fermions, with an observed significance of 3.8 standard deviations, when 4.4 are expected…. Astronomical observations – such as the rotation velocities of galaxies and gravitational lensing – show that more than 80% of the matter in the universe remains invisible. Deciphering the nature of this “dark matter” remains one of the most interesting questions in particle physics and astronomy. The CMS collaboration recently conducted a search for the direct production of dark-matter particles (χ), with especially good sensitivity in the low-mass region that has generated much interest among scientists studying dark matter. Possible hints of a particle that may be a candidate for dark matter have already begun to appear in the direct-detection experiments; most recently the CDMS-II collaboration reported the observation of three candidate events in its silicon detectors with an estimated background of 0.7 events. This result points to low masses, below 10 GeV/c2, as a region that should be particularly interesting to search. This mass region is where the direct-detection experiments start to lose sensitivity because they rely on measuring the recoil energy imparted to a nucleus by collisions with the dark-matter particles. For a low-mass χ, the kinetic energy transferred to the nucleus in the collision is small, and the detection sensitivity drops as a result. 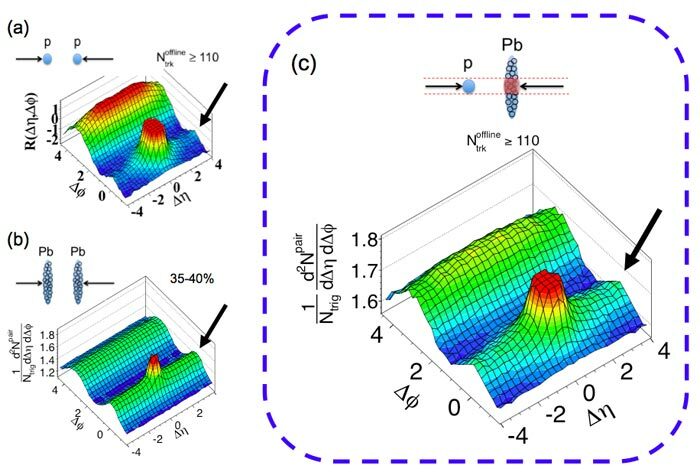 CMS 90% CL upper limits on the χ–nucleon cross-section as a function of χ mass for spin-independent (left) and spin-dependent scattering (right). Also shown are limits from other experiments, and the 68% and 90% contours for the candidate events from CDMS (arXiv:1304.4279 [hep-ex]). The CMS collaboration has searched for hints of these elusive particles in “monojet” events, where the dark-matter particles escape undetected, yielding only “missing momentum” in the event. A jet of initial-state radiation can accompany the production of the dark-matter particles, so a search is conducted for an excess of these visible companions compared with the expectation from Standard Model processes. The results are then interpreted within the framework of a simple “effective” theory for their production, where the particle mediating the interaction is assumed to have high mass. An important aspect of the search by CMS is that there is no fall in sensitivity for low masses. The monojet search requires at least one jet with more than 110 GeV of energy and has the best sensitivity if there is more than 400 GeV of missing momentum. Events with additional leptons or multiple jets are vetoed. After event selection, 3677 events were found in the recent analysis, with an expectation from Standard Model processes of 3663 ± 196 events. The contribution from electroweak processes dominate this expectation, either from pp → Z+jets with the Z decaying to two neutrinos or from pp → W+jets, where the W decays into a lepton and neutrino, while the lepton escapes detection. With no significant deviation from the expectation from the Standard Model, CMS has set limits on the production of dark matter, as shown in the figures of the χ–nucleon cross-section versus χ mass. The limits show that CMS has good sensitivity in the low-mass regions of interest, for both spin-dependent and spin-independent interactions. 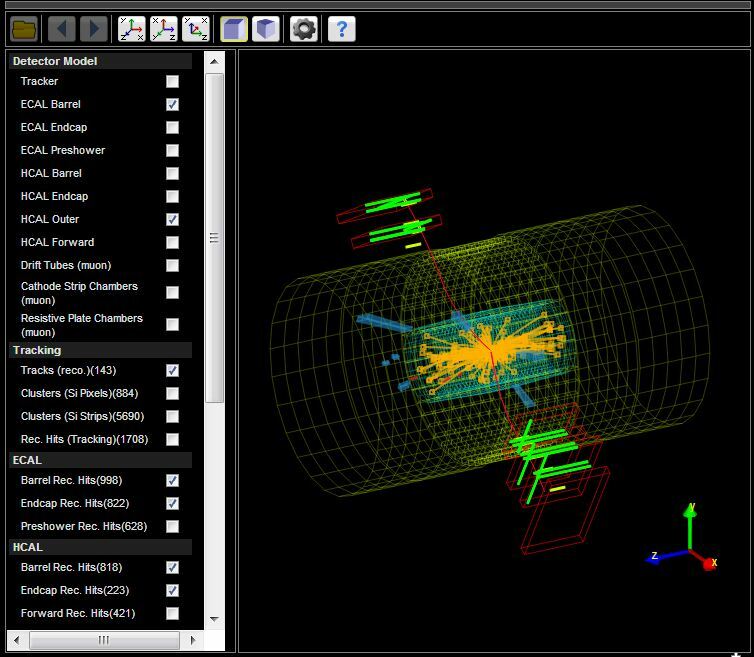 The CMS experiment at the LHC has released a portion of its data to the public for use in education and outreach. Explore this page to find out more about the data and how to analyse it yourself. The first data from proton–lead collisions at the Compact Muon Solenoid (CMS) experiment at the Large Hadron Collider (LHC) at CERN include a “ridge” structure in correlations between newly generated particles. According to theorists in the US, the ridge may represent a new form of matter known as a “colour glass condensate”. When a graph is plotted of the fraction of particles versus the relative transverse emission angle and the relative angle to the beam axis, the correlation appears as a distinct ridge. Now, this ridge has been seen in proton–lead collisions for the first time – within a week of data collection at CMS (see image below, part c) (arXiv:1210.5482). Although observations of ridges in different experiments would suggest a single cause, theorists believe there may be more than one explanation. When pairs of nuclei (such as gold or lead) collide, they can produce a hot, dense medium similar to quark–gluon plasma, a type of matter thought to have existed very soon after the Big Bang. The motion of this plasma probably correlates the underlying particles into the ridge structure.